I just returned from Miami, Florida where I had an exciting preview of HGTV Urban Oasis; a luxurious two-bedroom condominium located in the Paramount Bay building. Paramount Bay is a 47 story residence in Miami, Florida with amazing views of Miami Beach, Biscayne Bay and the Port of Miami. This is HGTV’s third annual Urban Oasis Giveaway and beginning August 1st; fans can visit hgtv.com/urbanoasis and check out the condominium and the view from the terrace. The real fun takes place between August, 23 at 9:00 a.m. through October 15, at 5:00 p.m., when consumers can enter for a chance to win the HGTV giveaway. HGTV is considered America’s leading home and lifestyle brand, with a cable network, and the nation’s leading online home-and garden destination. The brand also includes the HGTV HOME consumer products’ line, which showcases exclusive collections of paint, flooring, and soft goods and other home-oriented products line, as well as HGTV Magazine, a new home and lifestyle publication published in partnership with Hearst Magazines. Sponsors for the HGTV Urban Oasis Giveway includes: iRobot Corporation, Cabinets To Go, the Sherwin-Williams Company, Kohler and Mullican Flooring. 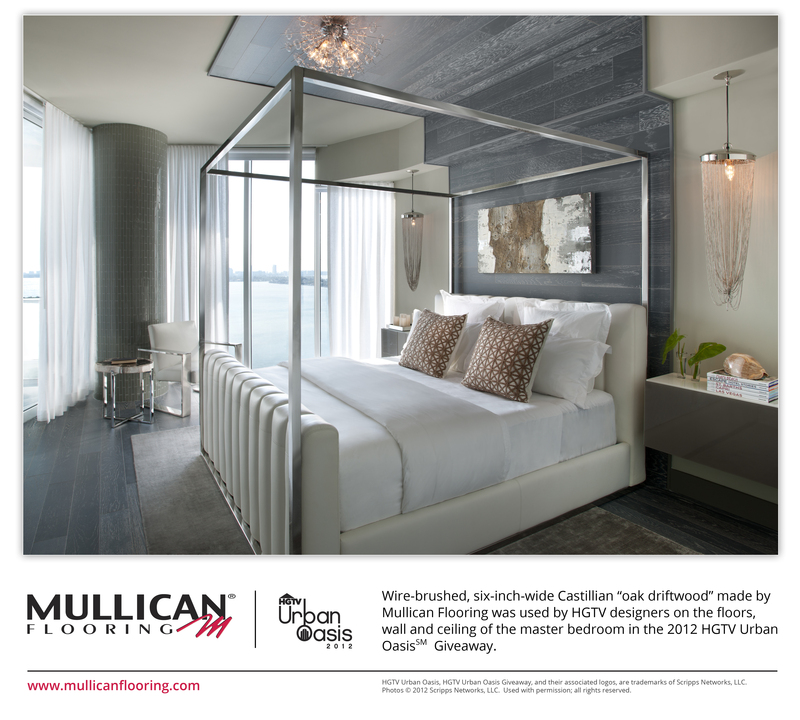 This is the second time that Mullican Flooring has been chosen to provide hardwood flooring for the HGTV Urban Oasis Giveway. Mullican was a sponsor for the 2010 Giveway. Being a flooring person, I’m always looking down, so the first thing I noticed was the floor. The product is Oak Driftwood from Mullican’s Castillian Collection and was used throughout the 1700-foot residence. The Castillian Collection is an engineered wood flooring product. Usually engineered woods, are more dimensionally stable than solids and are used in areas where the moisture level is high. It makes sense that the product would be used for an installation close to the water. The coloration is what I would call a “washed gray, ” or a weathered look. I took photos of the floor and followed it thought the residence. Usually flooring is used as the backdrop for a room (so as not to interfere with the furnishings) or as the focal point. In this case, it was actually both! Not only did it provide the backdrop for the gorgeous white leather furniture, pastel area rug, and ivory accessories, but once you looked down; it became the focal point. Immediately, you became focused on the grain of the wood. The grey/white washed coloring, and graining adds to the elegance of the interior. The bedroom was my next step. I was told to look for an unusual wood application. Much to my surprise and delight, it was being used as a backdrop (similar to a headboard)behind the bed in the master bedroom and on the ceiling! I asked Tressa Samdal Marketing Manager for Mullican, about the unusual application of their product. Please take a close look at the photo above and the interesting use of the flooring above the bed. It certainly makes the room. Ask your flooring professional how you might get creative with your flooring. Click on this link for a video interview with Lindsay Pumpa and her design ideas for Urban Oasis.